This is not your traditional summer camp! These are Visual Art Intensive Classes for kids, teens and adults that want to flex their creative muscles this summer. 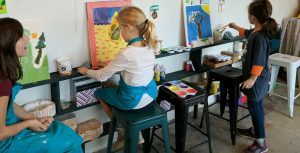 With only 6 students per class and one teacher and one assistant each participant will get plenty of art instruction and guidance. Discounts for siblings/ family and discounts for four or more class days are available. Sign up soon to guarantee a spot!